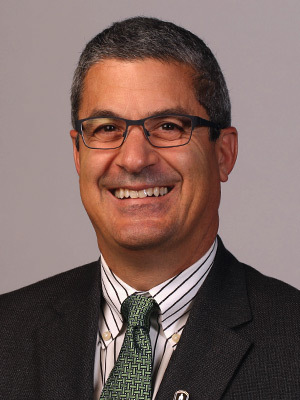 Mr. David Rosselli joined Baylor as vice president for university development in November 2015. In 2017, he became vice president for university advancement, overseeing university development and alumni engagement. He previously served as senior executive director of institutional advancement at the University of Southern California, where he managed the development operations and staff for the advancement office in San Francisco. Prior to his time at USC, Mr. Rosselli served as assistant dean for institutional advancement at the Arthur A. Dugoni School of Dentistry at the University of the Pacific, where he was responsible for all areas of campaign development and fundraising for the school’s $150-million relocation to downtown San Francisco. Before that, he spent six years as associate athletic director at the University of California, Berkeley, overseeing a $500-million athletics campaign that included a $350-million stadium renovation. Prior to his work at Cal, he spent more than six years as the director of development for the schools of business and engineering at University of the Pacific. Mr. Rosselli is a former television and radio broadcaster, including stints as an analyst for the Golden State Warriors and the San Francisco Giants along with University of California football and basketball, play by play for Pacific football and basketball, and television play by play on Comcast Sports at Fresno State. In 2018, Mr. Rosselli called Baylor Bears men’s basketball on the radio during games when John Morris moved over for television assignment. Mr. Rosselli is a graduate of the University of the Pacific, having earned a bachelor’s degree in broadcast journalism and a master’s degree in educational psychology. He and his wife, Christine, are honored to be a part of the Baylor family.